Weekend ranchers abound around Brenham, but few run 500 head of Brangus cattle, raise and train cutting horses and sell steel fencing materials to the neighbors. Occupying 1,400 verdant acres south of Brenham, the Whitley Ranch is one of the area’s largest working ranches. But owners Jackie and Ron Whitley also wanted a country home that was all about ease and simplicity. They spend at least two weekends a month here; and because it’s only an hour and ten minutes from Houston, Ron often drives up just to ride his horses for an afternoon. The 4,000-square foot main house, completed last year by Thompson Custom Homes, sits atop a rolling hill. The home mostly is wide-open living-dining-kitchen space. There also is an office and a master bedroom, and guests have their privacy in two adjacent cottages. The home’s heart is a massive fireplace whose materials nod to Ron’s primary business, the Houston-based Ranger Steel. At 10-feet long, with a 5-foot mouth, the fireplace has a 7-foot-high base of stone. It also contains 18 tons of structural and cosmetic steel, including a chimney of dark gray steel plate melted and manufactured by Nucor Steel. Rich in details, every room in the home has a story to tell, and it’s usually a very old one. The kitchen’s limestone floors are French antiques, while the ceilings are built from weathered wood sourced in Wyoming. Ron’s collection of antique saddles is distributed around the house, so you never forget the business outside. Houston flooring guru Greg Schenck created another defining feature: floors made from reclaimed shipping pallets. Fittingly, they were inspired by ceilings at the Gage Hotel in Marathon. Schenck first noticed the Gage’s rustic, hand-cut latillas and vigas as he sat in the hotel’s bar. Admiring their crossing lines, he thought the pattern might make a cool floor design. Shipping pallets, with their pre-cut short strips, were just the right size. Making a sample to show clients was easy enough. Replicating it over several thousand square feet – well, not so much. 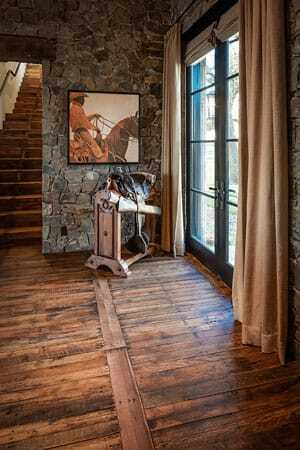 Schenck & Company first applied the design on a large scale about seven years ago, when the Whitleys wanted a reclaimed wood floor for their Tanglewood home in Houston. They loved it so much they wanted to repeat it at the ranch, which was finished last year. It was just as much of a challenge the second time around, Schenck said. He ordered truckloads of pallets to get enough pieces with the right patina and a good mix of hardwoods and softwoods. Then his team had to remove nails, dismantle each pallet and finesse the edges and corners of each piece. Installation at the ranch took a labor-intensive five months. Lightly smoothed and burnished like hand-rubbed furniture with a penetrating oil sealer, the myriad grain patterns and natural colors create floors that both belie and celebrate their humble origins. In April, the National Wood Flooring Association awarded Schenck & Company “Best Reclaimed Wood Floor of the Year” for the project. That’s simplicity at its best. 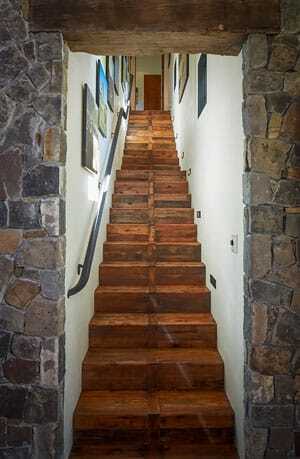 Greg Schenck created one of the home’s defining features: floors made from reclaimed shipping pallets. The ranch home mostly is wide-open living-dining-kitchen space. 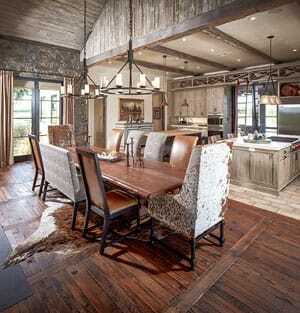 The project was named “Best Reclaimed Wood Floor of the Year” by the National Wood Flooring Association. Ron Whitley’s collection of antique saddles is distributed around the house.